A woman who was undergoing tests for suspected swine flu has been given the all-clear, a west London hospital has confirmed. She was admitted to the West Middlesex University Hospital in Isleworth on Tuesday morning after walking in with flu-like symptoms. The woman, who had recently returned from Mexico, was kept in isolation while being tested. She will now be discharged after the test results came back negative. A spokesman for the West Middlesex University Hospital said: "We can confirm that we have admitted a female patient who has recently visited Mexico. "The patient's condition is described as stable." This was the first suspected case of swine-flu, H1N1 virus, in the capital following the confirmation of two cases in Scotland. 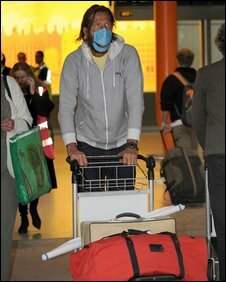 As a precaution passengers are being screened for flu-like symptoms at Heathrow Airport.